Sutter Keely (Miles Teller) is always the life of the party. Making the most of every moment without thinking about the consequences, he coasts his way through a C-average high school existence and sneaks liquor into every aspect of his daily routine. Quick to categorize his peers as "the rich kid" or "the stoner," he never takes the time to ask how they might be categorizing him. After one of many benders, he winds up passed out on someone's front lawn where Aimee Finicky (Shailene Woodley) finds him during her morning paper route. Full of bashful awe and naïve innocence, she plays as the perfect audience for Sutter's endless stream of one-liners and inappropriate behaviour, embodying the very propriety and sheepishness he unconsciously tries to subvert. Though everyone in Sutter's life points out that his interest in the brainer girl with a bright future is callous, insomuch as he's likely to devastate her eventually, he's too preoccupied with the now and the pleasure he's getting from her interest to care. Even as their friendship and relationship begin to blossom, with some of the most naturalistic and convincing extended takes of dialogue (you genuinely feel like you're watching two people fall in love during a protracted single take of conversation) captured on film, Sutter messages and flirts with his more conventionally attractive ex-girlfriend Cassidy (Brie Larsen). 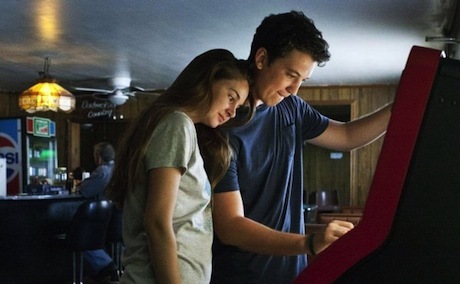 The tone of The Spectacular Now, James Ponsoldt's devastatingly sincere and astoundingly powerful teen love story about insecurity, denial, self-hatred and the pain of maturity, shifts ever so slightly with the degree of awareness the characters demonstrate. Initially comical and touching, it captures the excitement of nascent romance and the presentation, or veneer, that people give to those they first meet. But as Sutter and Aimee get to know each other, we learn of absent fathers and deeper scarring on both ends that both parties either shrug off with comedy or distort into a convenient truth. Once we start to understand the sort of lasting emotional damage that Sutter can, and likely will, inflict on Aimee, the tone becomes for more intense and honest, reflecting the painful and unflinchingly astute realities these well-developed, entirely convincing, characters are acknowledging about themselves. And if the tone and absolutely brilliant writing weren't enough to make The Spectacular Now a rare and memorable cinematic experience, both Woodley (in particular) and Teller deliver career-defining performances with the nuance and certainty of professional actors twice their age.